The Excel Import is an add-on for Dynamics GP's General Ledger. It allows an user to browse a Excel spreadsheet and import journal data into an unposted General Ledger batch - all from within the journal entry screen within General Ledger. Traditionally, Dynamics GP users that needed to do such an import from a spreadsheet, had to key them in manually or ' jump through a few hoops' and use Integration Manager or other custom tools to accomplish this. 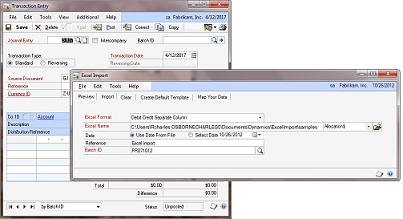 This Excel import add-in provides a simple and affordable end-user solution to accomplish this- all within the GP interface. The Excel import navigates and behaves like Dynamics GP screens and can be launched from within the additional menu selection of the journal entry screen within General Ledger. This once again simplifies training and the use of the Excel Import.